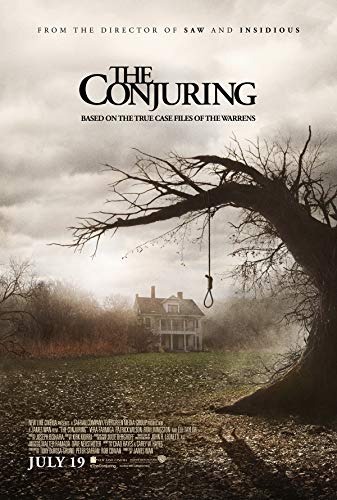 In 1971, Roger and Carolyn Perron move into a dilapidated farmhouse in Harrisville, Rhode Island with their five daughters Andrea, Nancy, Christine, Cindy, and April. Their dog Sadie refuses to enter the house and one of the children, while playing a game of "hide and clap", finds a boarded-up entrance to a cellar. Paranormal events occur within the first few nights: all of the clocks stop at exactly 3:07 AM and Sadie is found dead in the backyard. One night in bed, Christine encountered a malevolent spirit only she can see, prompting her to claim that the spirit wants her family dead. Another night, Carolyn hears clapping in the hallway. When she goes to investigate, following the noises, she gets trapped in the basement by the spirit. At the same moment, Andrea and Cindy are attacked by the spirit on top of the wardrobe. Read more on Wikipedia.